For the most part, your options are pretty limited on how you get to Hawaii. You can come by boat or by air, and that's just about it. Either method of transportation is fine, but we personally prefer to arrive by air- and that's an understatement! A long cruise can spoil the joys of arriving on Hawaii's shores, as the journey simply takes too long. There is something to be said about that built-up anticipation of just waiting to step foot on the island, and a flight is the best way to do just that. That's why we recommend flying as the best way to travel to Hawaii. This way, you can leave home and arrive in paradise on the same day. And even for travelers on the far East Coast of the mainland, it's only a 12-14 hour flight. OK, so that's not exactly a short flight, but it sure beats coming by boat. Besides, that plane ride gives you a chance to peruse your itinerary, travel books, and plans to refresh your memory before you arrive. Just don't expect to jump off the plane and start "doing it all" after you arrive. That said, for some of you this next paragraph is going to be redundant and obvious, but for others, it will be good information to have. Perhaps you've flown on long trips before and perhaps you haven't. We're going to assume most folks have likely never flown on a flight over 5-7 hours before and we're also going to assume that most visitors utilizing our website are from the mainland United States. If you're traveling from even further east, like Europe, then you'll need to adjust our advice as needed to accommodate you. If you're traveling from the west, like Australia, then take our advice in reverse. When traveling from the west your jet lag will be worse coming than going. But most visitors are coming from the east, and whether you're coming from sunny California or chilly New York the shortest amount of time you'll be on a plane is about five to six hours. If you're flying from New York, Boston, or most any other town on the East Coast you can expect to add another four to five hours to that number. In general, planes will have to fly into headwinds on their way west toward the islands, and thus you will notice your flight to the islands taking longer than your trip back home. Most visitors who are heading to the islands of Hawaii or Kauai may have to first make a stop in Honolulu, as there are few flights that fly directly into Kona, Hilo, or Lihue airport. If you're flying to Molokai or Lanai, you can definitely count on a stop in Honolulu or Kahului on Maui. Many flights do fly directly into Kahului on Maui if you're visiting that island. If you're coming from the East Coast in the spring, for example, you're going to gain six hours during your flight. So if you leave at 6 a.m. and arrive at 4 p.m., you've actually been awake a lot longer than it sounds. Back home it's actually 10 p.m. when you arrive in Hawaii, so you've already had a full day. We believe that by keeping to your regular schedule you can avoid the worst cases of jet lag, plus you'll have a leg up on most other travelers. If you can continue to get to bed early after sunset in Hawaii-- say around 8-10 p.m. Hawaii time-- then you can get up a lot earlier than most visitors and hit the road far ahead of the crowds. For an East Coast traveler, even a wake-up call of 5 a.m. in Hawaii is the equivalent to 11 a.m. back home. It is our opinion you should use this to your advantage. When all is said and done it will also make your journey back home a lot easier, too. Losing three to six hours heading home to the west is a lot harder than most people think. Regardless of how you arrive in Hawaii, take it easy the first day you arrive. A good night's rest and a good meal after a long day's journey will refresh you for the rest of your vacation. Also, leave the fast-paced mainland behind you... relax into Hawaii's lifestyle now. Let's be honest, traveling to Hawaii isn't cheap. Almost any mode of transportation to arrive on these beautiful shores is going to cost a pretty penny. Booking a room here isn't the deal some folks are used to when they travel (though you can find bargains if you look), occupancy is almost always high, and so are the prices. And the cost of importing goods to the islands is passed on to you by merchants, especially at the grocery store and gas station. The only real break you'll catch is with a rental car-- competition is fierce, and the prices reflect it. As a traveler to Hawaii, you will likely come under one of two conditions: the budget traveler or the luxury traveler. Believe it or not, Hawaii may be just about the only place you can choose one style over another and leave with the same experience. Most people who have tried both lifestyles have reported having just as good a time either way. So whether you conscientiously save money in Hawaii by seeking out great deals or spend loads of money on resorts, tours, and fine dining, you'll likely leave with the same great experience. That's the magic of Hawaii; the real gift is what's around you... the natural beauty of the island, the people, and the friendly atmosphere. Sure, you can buy great things, participate in amazing activities, and eat in first-class restaurants while here, and we certainly encourage travelers to live life in Hawaii to the max. On the same token, we also encourage everyone to enjoy the best part of Hawaii, the part that's free to everyone-- the spirit of Aloha. Ultimately, our point is that you don't have to spend a fortune on a Hawaii vacation to have a good time. Our website is designed for every type of traveler- whether you're on a tight budget or are looking to splurge. We offer fun tours and activities on Maui, Kauai, Oahu, and Big Island; and you'll surely find accommodations and activities that give you the best Hawaiian experience for your vacation dollars. Thankfully, technology has now made it easier than ever plan an amazing Hawaiian vacation. 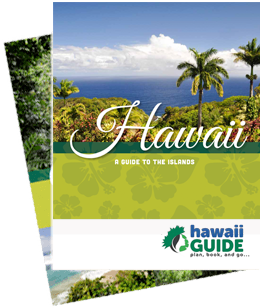 To that end, here Guide of US-Hawaii, our goal is to be your one-stop-shop for Hawaiian vacation planning. We are proud to offer a wide variety of Hawaii Travel Tips, Hawaii Tours, and Activities, Hawaii Accommodations, Must See and Do stops, and more to make planning, booking, and heading off to the Islands as easy and fun as lounging on your favorite beach. Well... almost!